The Digest Diet is a 21-day weight loss program created by Liz Vaccariello, editor in chief of Reader’s Digest. This plan focuses on healthy natural foods that have been scientifically proven to help you release body fat. Some foods have the ability to release fat from fat cells, while other foods help the body burn the fat once it’s released. These foods provide the foundation of The Digets Diet. The eating plan consists of three stages, which all highlight the fat releasing foods. But the calorie and macronutrient ratios shift in each phase to maximize your results. This is a four-day jump-start that helps you to quickly and safely release excess fat. Each day you will consume two smoothies containing ingredients like fresh fruit, nonfat yogurt and healthy fats. You will also have soup for one meal and one crunchy snack. During the second phase of The Digest Diet you will continue to have a shake for breakfast each day. For the other meals you will consume more lean proteins and micronutrient rich greens like spinach, kale and watercress. These foods give your body the fuel it needs to build muscle and release fat. You will also reduce your intake of carbohydrates to increase your fat loss results. However you can enjoy a glass of red wine with dinner if you like. The last week of the plan shows you how to enjoy a balanced, whole-foods diet for long-term weight management. If you still have more weight to lose you can stay in this phase as long as you like. Alternatively you have the option to cycle back through all three phases until you reach your goal. This final phase teaches you a way of eating for maintenance and consists of a healthy balance of carbs, protein and fat. Turkey, shrimp, chicken breast, steak, salmon, eggs, bananas, apple, strawberries, red grapes, avocado, spinach, celery, broccoli, cauliflower, asparagus, nonfat yogurt, fat-free milk, fat-free cheese, coconut milk, flaxseed meal, natural peanut butter, tahini, quinoa, whole-grain bread, oatmeal, honey, cocoa, olive oil, red wine. The Digest Diet explains that exercise alone is not very effective for weight loss unless combined with a healthy eating plan. Additionally aerobic exercise can actually increase your appetite and trigger you to consume more calories. The book includes the 12-minute “Fat Release Workout”, which combines strength and high-intensity interval training. These types of exercises will help you effectively burn fat and build lean muscle. 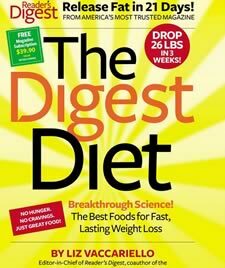 The Digest Diet: The Best Foods for Fast, Lasting Weight Loss retails at $24.99. Click here to purchase The Digest Diet for a discounted price. Most dieters will experience rapid weight loss in beginning phases of the program. Food recommendations are based on scientific research. Demonstrated to be effective in a trial with twelve men and women. Workouts are short and effective and can be performed at home. Teaches healthy eating behaviors for long-term weight management. Diet is very restrictive in the first phase. Calories may be too low for physically active dieters, especially in the beginning. Research regarding weight loss benefits of consuming high amounts of dairy has been contested by some health experts. Not suitable for individuals with an intolerance to dairy products. Does not include a vegetarian menu. The Digest Diet focuses on foods rich in specific nutrients that have been associated with weight loss benefits. Most dieters will probably lose weight fairly rapidly during the first two weeks. However this will be primarily due to the very low calorie intake in the initial phases of the diet. Nevertheless, this program does offer valuable information regarding how to eat as a healthy lifestyle approach to long-term weight management.